The weather is starting to cool off and a big ole bowl of chili fits the bill! 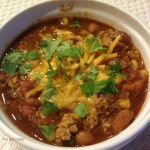 Make it hassle free with this Crockpot Turkey Chili! Happy Friday! This week has flown by and with it has brought cooler weather to south Florida. Finally! Now I know some of you northern folks are gonna laugh at this but it’s dipped into the 60s for the low. A light jacket in the morning is a must. And the AC can finally be shut off and the windows can be opened. I love it. Fall in Florida is by far my favorite time of the year. Sure, we don’t get to experience the changing colors of the leaves or apple picking but we have some darn beautiful weather. With palm trees. And beaches. And sun! One of my favorite things to do when the weather gets cooler is to make soups. Now don’t get me wrong, I will make soups all year long, even in the summertime when it’s 90+ degrees outside. 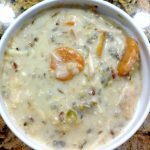 I am not one of those people who thinks that certain soups can only be enjoyed during the fall and winter seasons. In fact, I made this Crockpot Turkey Chili in August. But the keyword here is crockpot. The crockpot doesn’t heat up my house like my stove or my oven does. And I don’t have to stand over it during certain steps of the cooking process because well, there really are only two steps to the cooking process of this chili. Cook the ground turkey, throw everything into the crockpot, cook on low for 8-10 hours. It really is that simple. It’s a win-win situation all around! So make this during the summer. Make this during the fall. Make it anytime that pleases you. Your crockpot will make it super simple! Enjoy! In a large skillet over medium-high heat, cook the ground turkey until browned. Spray your crockpot with cooking spray to coat the bottom and sides. Add the cooked ground turkey. What is your favorite soup to enjoy during the cooler weather? 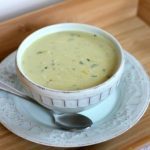 Do you eat soups year round? Do you prefer ground beef or ground turkey in your chili? Do you like chili cheese nachos? Chili cheese tacos? Do you want to eat a big ole bowl of chili right now since I’ve been talking about chili so much? This will warm you up especially at those “big game” football parties! It is so cold here in NC that we have had to turn on our heater! Love these warm dishes! This looks delicious! I know what you mean, as soon as the weather starts to turn I search for soup and chili recipes! I’ll have to try your chili Julie. It looks perfect! It was 38 here last night, I prefer it 45 or above, ideally. I don’t make soup enough. Your chili looks fabulous, Julie! Glad you are enjoying the weather. We have a gorgeous fall weekend here in Denver too. Mid 60s which is ideal. 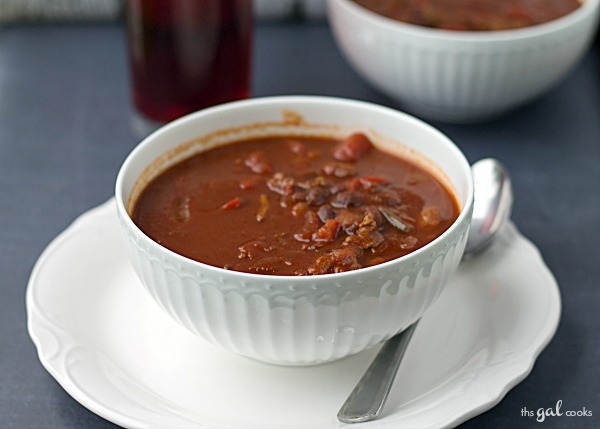 Your chili will be perfect for football games. I’ll have to make it to cheer the Broncos on! Hi Julie, well you know where I live…it’s been chilly here! And speaking of chili, this looks wonderful and will be on my menu – pinned! I enjoy soups all year round. Oh I love chilli when it gets cold. I’ve made two batches already this fall. This looks very good and will be getting on my menu plan…turkey = healthier meaning more servings!! Pinned! Now I need to go get a crockpot, can’t believe I don’t have one. The slowly cooked chili looks so good. This looks so perfect for our chilly weeks ahead. pinning. Funny thing is, you just reminded me of my AC… it still goes on in the daytime…but then the heater is on during the night. Utah doesn’t really have a happy medium! 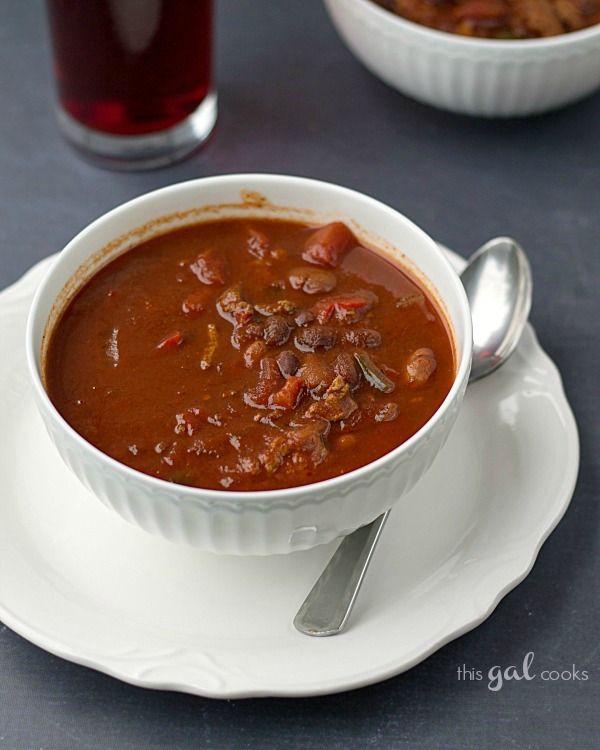 Loving this easy chili…I’m a huge chili fan! Pinning! PS… I love your white dishes. So classy! Yum, Julie! I have not yet made a pot (or Crock Pot) full of chili yet this fall! Your post reminds me that I need to get on that asap. ;) Pinned & sharing! Well darn, Carrie, you need to get on the ball! :) Thanks so much for the pin and share! Is it really a quarter of a cup of chili powder? That seems like way too much. Yes, it is really a quarter of a cup, which is the equivilent to 4 tablespoons. It really isn’t that much considering how much chili the recipe makes. You can always add less if that is what you prefer. Thanks for contacting me!